When choosing a wood floor for your home, how do you know which type suits your needs and budget? It can be overwhelming to learn all the different types of wood floors but knowing the basics can help you find the right one for your home. Before making a decision, remember the three primary choices of wood floors: engineered wood, solid wood, and laminate flooring. Engineered wood is made of a top layer of thin-sliced hardwood and a base of high-quality plywood. It is the best option for homeowners who are working with a tight budget. Since engineered wood can be installed through fold-and-lock, glue, nailing, or stapling, you can save money on the cost of getting an installation service. Another key feature of engineered hardwood is its ability to withstand moisture especially in areas where light moisture might be present including basements and kitchens. It can also stand up to constant pressure without any significant damage. And what makes engineered wood popular today is it is eco-friendly and sustainable. As it consists of two different types of wood, hardwood and plywood, it uses fewer wood resources and consumes less water to make. Solid wood is made of 100% wood from top to bottom and side to side. 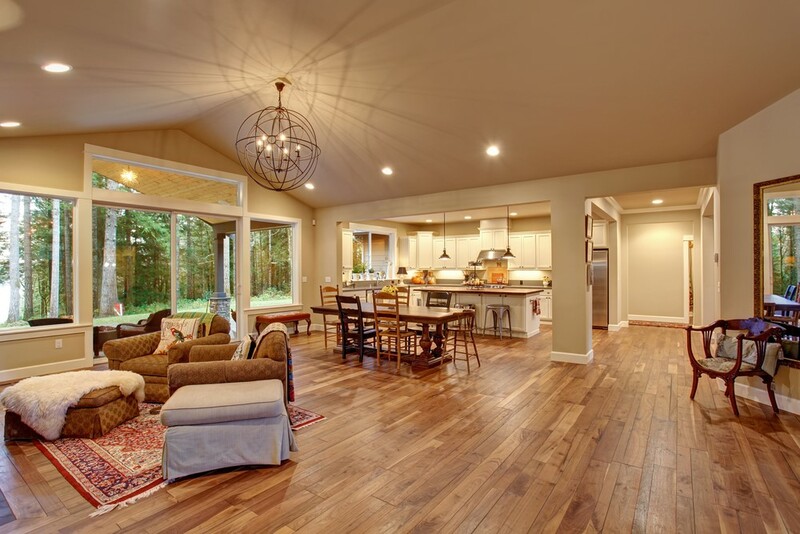 When it comes to durability, nothing is comparable to this type of wood flooring. When well-maintained and properly taken care of, it can last a lifetime. It is recommended for bedrooms, dining rooms, hallways, and living rooms. What makes solid wood especially appealing to homeowners is it can be sanded many times, which means you can restore its beauty in no time when it starts to look worn and tired. This is the greatest advantage of solid wood over engineered wood. You can sand solid wood five to six times, but you can sand engineered wood only once or twice. Choosing solid wood brings a long list of benefits to the table, including cost efficiency, versatility, increased home value, and timeless beauty. If you’re looking for a flooring material that is easy to install and maintain, then vinyl flooring fits the bill. Vinyl flooring has a wide array of wood look-alike designs. It is cost saving as it can be placed over existing tiles without hacking the original floor tiles. Vinyl flooring is a lot easier to install compared to solid wood and engineered wood. You can actually do it on your own without any help from professional installers. With the right tools, preparation, and procedures, you can complete an entire HDB flat in one day. When it comes to cleaning, you can easily clean it by using a broom, mop, regular floor cleaner, or vacuum. Another advantage of vinyl flooring is it is scratched and water-resistant. It can stand up to scratches caused by sliding tables or chairs, your floor stays clear and flawless. And unlike hardwood, vinyl flooring works well in moist areas such as kitchens too. Vinly flooring, however, when it is damaged, the only solution is to replace it. Although there are many types of wood floors, the point is to get the one that addresses your needs and matches your preferences so that you won’t have to concern yourself with problems in the future.